as promised during GUADEC, I’m going to blog a bit more about the development of GSK — and now that I have some code, it’s actually easier to do. so, let’s start from the top, and speak about GDK. in April 2008 I was in Berlin, enjoying the city, the company, and good food, and incidentally attending the first GTK+ hackfest. those were the days of Project Ridley, and when the plan for GTK+ 3.0 was to release without deprecated symbols and with all the instance structures sealed. 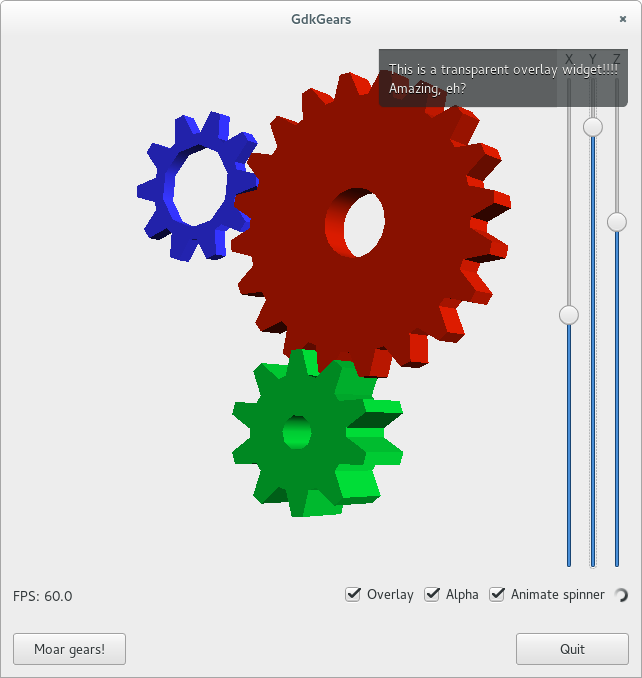 in the long discussions about the issue of a “blessed” canvas library to be used by GTK app developers and by the GNOME project, we ended up discussing the support of the OpenGL API in GDK and GTK+. the [original bug][bug-opegl] had been opened by Owen about 5 years prior, and while we had ancillary libraries like GtkGLExt and GtkGLArea, the integration was a pretty sore point. the consensus at the end of the hackfest was to provide wrappers around the platform-specific bits of OpenGL inside GDK, enough to create a GL context and bind it to a specific GdkWindow, to let people draw with OpenGL commands at the right time in the drawing cycle of GTK+ widgets. the consensus was also that I would look at the bug, as a person that at the time was dealing with OpenGL inside tool kits for his day job. well, that didn’t really work out, because cue to 6 years after that hackfest, the bug is still open. to be fair, the landscape of GTK and GDK has changed a lot since those days. we actually released GTK+ 3.0, and with a lot more features than just deprecations removal; the whole frame cycle is much better, and the paint sequence is reliable and completely different than before. yet, we still have to rely on poorly integrated external libraries to deal with OpenGL. luckily, thanks to Alex, the amount of changes in the internals of GDK was kept to a minimum, and we can enjoy GL rendering running natively on X11 and Wayland, using GLX or EGL respectively. on top of the low level API, we have a GtkGLArea widget that renders all the GL commands you submit to it, and it behaves like any other GTK+ widgets. today, Matthias merged the topic branch into master, which means that, barring disastrous regressions, GTK+ 3.16 will finally have native OpenGL support — and we’ll be one step closer to GSK as well. right now, there’s still some work to do — namely: examples, performance, documentation, porting to MacOS and Windows — but the API is already fairly solid, so we’d all like to get feedback from the users of libraries like GtkGLExt and GtkGLArea, to see what they need or what we missed. feedback is, as usual, best directed at the gtk-devel mailing list, or on the #gtk+ IRC channel.